Want to scare the neighbors? Wish to send chills down the spine of people walking past your home? Hoping to terrify any potential burglars from testing your locks? If so, menacing Mummy translucent window decoration might be just what you are looking for. Placed in one of your windows, the scary figure will catch people’s attention and either make them laugh with merriment or run for the hills as fast as their legs will carry them, if they have not already fainted. Designed especially for double windows, the decoration is basically a plastic film substrate printed with water-based inks portraying a Mummy figure with arms outstretched. Removable corner stick adhesive squares make it extremely easy to fit in place and equally as easy to remove and use again at a later date or different location. It even comes with its own poly-bag storage to keep it in good condition when not in use. What’s more, you can trim the decoration to fit your particular window pane dimensions. The best bit about this scary Mummy window decoration is that when the interior room lights are lit, the light illuminates the Mummy and makes it clear to see from miles around. Anyone stumbling around a hedgerow, fence or wall late at night that suddenly comes face to face with your window will be in for a big shock. The decoration is perfect for Halloween and other ghostly festivals and celebrations. Birthdays and special parties will also make fantastic moments to add a little décor to your house and garden. Some previous buyers note that the Mummy becomes a favourite among friends, family and the neighborhood with drivers and walkers stopping to admire the eye-catching spectacle. Just be careful not to put it next to a busy road or it might cause some traffic accidents. 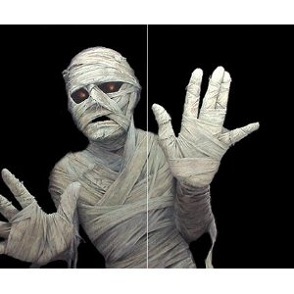 You can buy this spooky decoration from here: Menacing Mummy Translucent Window Decoration . Suitable for window sizes from 24″ x 36″ to 36″ x 60″.